Winco Task Stools and Task Chairs may be equipped with High Resistance (HR) casters designed to reduce rolling movement. Standard casters roll freely and may move away from the occupant when leaving or entering the chair. The potential for unintended movement may be reduced with the use of HR casters; User should be attentive to the Stool position at all times. 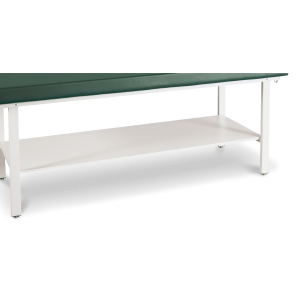 Optional storage shelf can be added to any treatment table for an additional fee.